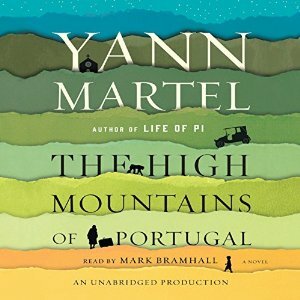 This month's book was Colette's choice The High Mountains of Portugal by Yann Martel. Present were Beth, Carla, Colette, Jane, Janet, Jolene, Michèle and Shirley. Jolene was our host. She had on the floor part of food she had prepared for us, as Odo liked it in the third novella of this book. She also wore a Portugal t-shirt and had other momentos from Portugal in the house. As it happens also, there is a painting of a rhinoceros on the wall of her home reminding us of the reference to the fables rhinoceros in Portugal. We can always count on Jolene to set the mood! Jolene had a very nice variety of cheese and crackers, my favourite spread fig and walnut and excellent chicken and pineapple skewers. She served us parfaits of vanilla ice cream with pineapple and strawberries. Yann Martel divided this novel into three parts in three different eras, a story called Homeless with Tomas in 1904, the second story Homeward set in the 1930's with pathologist Eusebio and the third story Home set in the 1980's with Canadian Senator Peter. All three men are dealing with grief, loneliness and the loss of their wives and in Tomas' case also the death of his son and father. Chimpanzees are present in all three stories, in passing through in Father Ullyses' diary in Homeless, more directly in Homeward with Eusebio stitching a chimpanzee along with a dog and his wife into a dead man's body following the autopsy and very prominently in Home with Odo the chimpanzee as Peter's constant companion. Yann Martel has written this book in the literary genre of magical realism. The Merriam-Webster online dictionary describes magical realism as a "style incorporating fantastic or mythical elements into otherwise realistic fiction." There are certainly incredulous incidences in Martel's stories and several allegories related to love, loss faith and religion. As a group, we were certainly divided. The majority did not like the book. They found the stories and their themes difficult to understand. What was the meaning of Tomas' voyage to discover the religious icon? What was the meaning of the difficulties he had. In the second story, several, who know the bible well, found many inaccuracies in the bible references and therefore the comparisons with Agatha Christie's novels seem to make no sense. What was the meaning of such a strange autopsy and what did it mean that Eusebio sewed back into the man's body, the chimpanzee, the dog and the wife? In Home, Peter's relationship with Odo the chimpanzee could be considered weird and the end leaves us with many questions, what does it mean when Odo holds Peter as Mary held Jesus after the crucifixion. It was not a book that they enjoyed and some finished feeling somewhat inadequate. A few of us enjoyed the book but it really meant reading the stories without questioning the meaning of the allegories and suspending your disbelief. We have one member who has decided to eventually re-read the book with the intention of understanding the symbolism and the references to religion and faith. We may eventually have a further discussion about this book. Despite the divergence of opinion there is great camaraderie in our group and there was no difficulty in accepting everyone's opinion. It was a lovely evening because we were able to catch up with one another after the summer, and to freely and enthusiastically compare our reactions and questions about the book. It's always interesting to me how varied our reactions are, and how friendly discussion prods us to consider others' and our own ideas more deeply. I certainly found it memorable, desolate and puzzling.